[RV] Probably, the project that is one of the most well known projects is our project for the National Gallery extension in London, in a very important site, Trafalgar Square. It’s known as the Sainsbury wing. And that is very, very complex in terms of how we did it. It’s a competition that we won. Very often if you’re good you don’t win a competition, but we miraculously did win the competition. And there’re a lot of ways we can approach… talk about how we approached it, but essentially on the outside, the façade is somewhat… well, it’s very important to look about the context. And the main aspects of the context are, it’s in Trafalgar Square so it’s a building which is helping form the exterior square or place in central London, probably that’s the biggest square in London. Then also, it does connect with an important building which is the National Gallery of Art, which is a symmetrical building, classical building of the 1830s. So, we were doing two main things when we were designing that building, from the stand point of the front and from the stand point of the outside. One was that it was to be a continuation of the existing building, although not a copy of it. And then the other was that it was to be a building that helped, that acknowledged its position on the piazza, on the square and helped the… improved… enhanced the quality of the square. And so, essentially what we did when we analysed the existing National Gallery building, it’s a building that has a classical vocabulary. And its main aesthetic element is that of rhythm that the vertical columns and pilasters on the building make for a kind of complex rhythm, that’s a little different in the front and then it extends beyond and varies as it goes, but it’s generally pretty consistent. So, the rhythm of our building is such that we actually copied, which horrified Modernists, we actually… on this one façade not on the rest of the building… we copied the vocabulary, the elements of the 1830s building. But we made the pilasters not have an even rhythm, but a rhythm which was uneven and which inflected toward the building next to it. So, therefore, it was a building separate from the other building by a space, but also inflecting toward the other building. So, it’s saying, we are part of the other building, we’re not just an addition, we are a continuation of it. And so this varied rhythm which is sort of jazzy, jazzy; with a sort of a jazz rhythm as opposed to the rhythm of the old building which was a sort of correct rhythm of maybe you’d find of a gavotte or a minuet. And then we had to have a very big entrance at the bottom to accommodate anticipated four million – I think it’s more than four million a year now – where the other building was built originally for a few thousand gentlemen a year. And so, it’s like the old building but it has this huge zoom entrance in it, which is contradictory to classical requirements and which has this indirect rhythm. And then, when you look at… from the side, you see the side of the building along that narrow space between the new and the old building and it is essentially a Meis van der Rohe, a Modern building with lots of glass and steel construction and then when you go in the back it’s different too. So, it’s a building that… whose façades all accommodate context. And then when you go in that’s another whole story, but essentially the outside was that. So, the building was easily misunderstood. I think a lot of people did love it. We have copies of good quotes and negative quotes from the writers. The negative quotes are wonderful: ‘It’s a piece of vulgar American’, blah, blah, and all that, and then there are other quotes that are very nice. But it is essentially a building where the pure Modernists said, ‘Oh it’s not Modern because it has a… because it has a… you know, these adapted Classical elements’. That’s what the Modernists said and then the Classicalists said, ‘Hey it’s not correctly historical because it has this jazzy rhythm, instead of a correct Classical rhythm’. Then the inside is another story which is interesting. But it is so nice that the client liked it and in general the… the family of the donors who gave all the money, a lot of money, more or less went along with it. We had some problems with dealing with the client, involving some details, but in general in the end it turned out – turned out on the outside – the way we wanted it. And it’s a building I love and it really does connect with us, which is Mannerism, it’s hard to… it’s hard to… it didn’t find one ideology, it didn’t find a consistent system and it does accommodate – because it’s accommodating to all these different, kinds of, symbolism styles and contextual requirements. 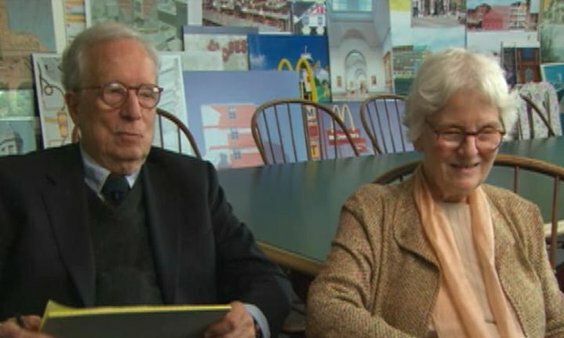 Internationally renowned architects Robert Venturi (1925-2018) and Denise Scott Brown (b.1931) have helped transform contemporary design through their innovative architecture and planning. Winners of numerous prestigious awards, their designs have championed multiculturalism, social activism, symbolism, pop culture, history and evolving technologies. Thomas Hughes is Mellon Professor Emeritus of the History of Science at the University of Pennsylvania and Distinguished Visiting Professor at the Massachusetts Institute of Technology. His most recent books include Human Built World, Rescuing Prometheus and American Genesis. He is a member of the American Philosophical Society, US National Academy of Engineering, Royal Swedish Academy of Engineering Sciences and the American Academy of Arts and Sciences.